Momentum is key when working in the Peace Corps. Projects live and die based on the momentum they have. If the community is interested, the momentum will carry the project forward. If something interrupts that momentum, then the community can lose interest. When that happens your project dies or you have to find a way to recapture the community’s interest and, with it, the momentum. This brings me to our garden project. Bins with some of our tomato plants off to a good start. Things started out great back in February? March? It seems so long ago. The snow cleared up, and the weather warmed. Teachers took turns taking students out to prepare the garden and even plant some seeds. We also started a pair of worm bins. Unfortunately, this didn’t last. After two weeks the weather changed again. Snow came back, and then we got rain. When things cleared up a bit, we’d look outside and say, “Right, tomorrow we get back out there”. Then more rain. Things became “what about this weekend?”, but it would never manifest. Oh, and the students “forgot” to take care of the worms. So they died. Not everything was lost. My director and I worked in small ways to make some steps and discussed other tactics we could use. We asked for a tree casting shade over the garden area to be trimmed, and found the whole thing cut off at ground level and hauled away. Amazingly useful that since that was my biggest concern for the garden (followed by its slope). We needed posts for the fence we were going to put around the garden. Armed my director’s grinder and a key from Tamriko, we unlocked the Room of Broken Lessons (my name for the room where we stash the broken desks and chairs). Amirani, one of our history teachers, worked with several 11th grader to cut the legs from broken desks, giving us metal posts in blue and green. We needed to teach our students garden related vocabulary in a way that captured their attention. So my director got me some poster paper, and I conjured a colorful garden vocabulary poster that we placed outside the Biology Cabinet for all the students and teachers to see and read. Making it also helped me with my Georgian. BJ's first totally awesome hand drawn garden vocabulary poster. More may come. Maia, our awesome biology teacher, went out and got several silk worms to help bring life in the garden into the classroom even as she prepares to restart the worm bins, this time with students knowing what responsibility they each have. Our "stone quarry" in front of the school. You need a permit to haul these ruins off to a dump, which means they'll be sitting there as a useless pile forever... at least until we decided to use them! 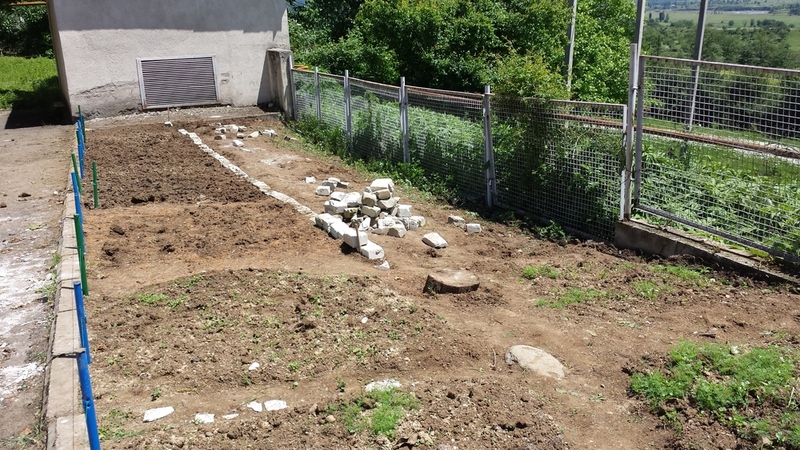 One day we also got some of the kids to move some stones to the garden for use later. The ground is sloped, so we could try to terrace it or even lay a path. I even went out and occasionally weeded when I had a free lesson, just something to keep the wilds at bay. Once in a while other students would help out, particularly during our long break. These were little steps that helped lay the groundwork for today, which was totally spontaneous. Both of my counterparts submitted project proposals for E-Twinning, and both were accepted. This is totally awesome, but… it also meant they both had to go to Tbilisi today. I’m not allowed to teach classes without my counterparts. Its a Peace Corps rule so that our counterparts don’t come to rely on us in that way and because we’re supposed to being improving our counterparts, not just teaching the kids. My director also teaches English and said maybe she could get time to help me teach one or two of the four lessons I usually have today. But then I took a look outside and said something to the effect of, “how about I just take the kids outside and we work in the garden?” Of course, I was in business casual, so I was totally wearing the wrong shoes for what was to come. Today, lesson after lesson we rebuilt our momentum. During long break (after third lesson), several of the older students came out to help. Even some students that are usually discipline problems readily pitched in to help. The director checked in several times, and different teachers came out to watch or help direct traffic too. Sure, some of the kids goofed off, and we had to break up some fights (seriously, look where you’re swinging that hoe!). It also didn’t matter how many times I told some students to get the roots out of the ground (in Georgian or English), they just didn’t get it. Plus where some students dove right in, some just sat around doing nothing or tried to disappear (you’d think they’d have learned they can’t hide from me by now). I’ll admit it, some of these things drove me nuts, but on the whole it was great. We weeded the ever loving $h!7 out of the ground, churned the soil, drove in posts for the fence, and started building a wall. 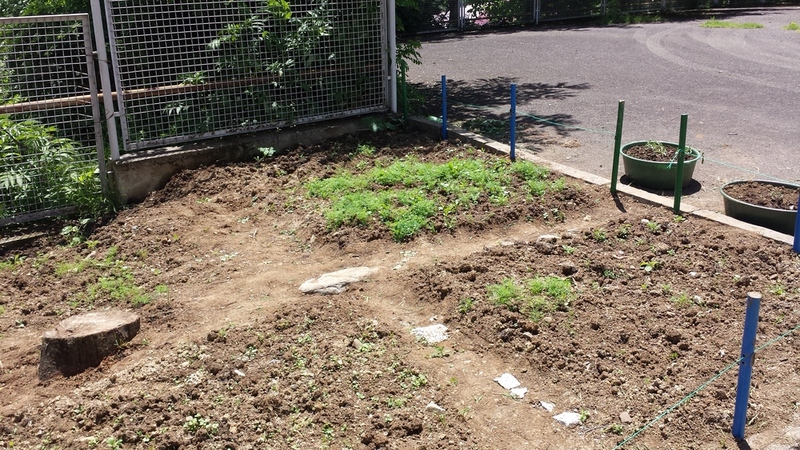 Where I started the first wall, the seventh graders (Luka and Biko) took ownership of it. The 6th graders then took it over. It got crooked, but that’s OK. It’s their garden too, and a little quirk isn’t a bad thing. Besides, Dato even ran home and got a wheelbarrow real quick to help haul more stones over for it. Where I hammered in the posts with the help of Tamuna (7th grade) and Jaba (11th grade), it was the sixth graders that helped me run a place holder string between them (we have wire mesh, we just need to cut it). It didn't matter how long I was out there working because I was never alone. The students were there doing more than me. So for today at least, we regained momentum. Now we just need to keep it going. 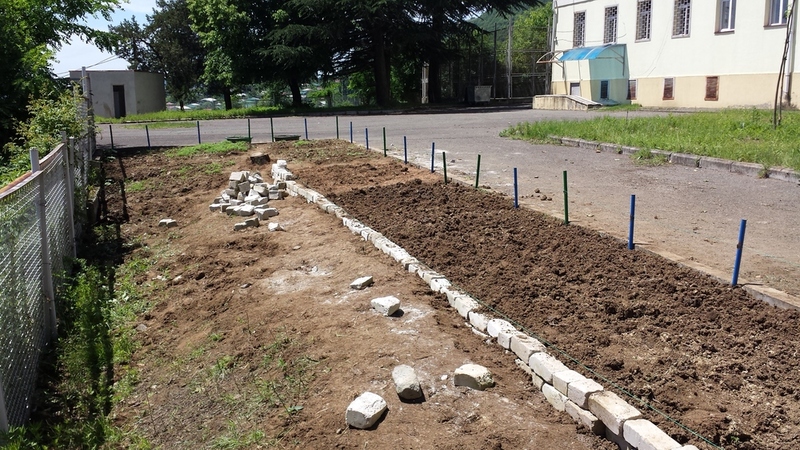 Next up: Plant more seeds and seedlings, finish the first wall, and cut and attach the wire fencing to the posts. Note on photos: As I was so caught up in things, I didn't even think to go get my camera until after we finished for the day. I hope some of my students post pictures on Facebook of everyone hard at work. They really did a great job today, and I regret that I don't have any pictures of them in action (or any pictures of what it looked like before).